crafting with katie: My Creative Time January Stamp Release Blog Hop! Welcome to the first My Creative Time Blog Hop of 2012! Emma has some awesome stamps and dies releasing today! If you haven't been to her blog yet today, head over there now to see her video introducing each of the new sets. And, be sure to scroll down to the bottom of this post to see today's awesome giveaway! For my layout today, I am showcasing one of Emma's brand new sport sets: Soccer. 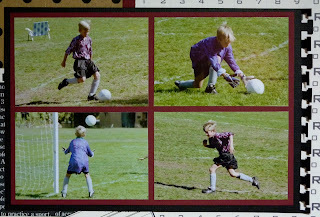 Eric played soccer for several years in elementary school, so I was thrilled to have a stamp set that I can use while scrapping those pictures. This is a 12 x 12 layout. I made my polka dot paper by printing a pattern from the Cricut Imagine Black & White cartridge on kraft cardstock from The Paper Company. The rest of my patterned paper is from the Teresa Collins Sports Edition II collection. I cropped my four action shots, printed them at 2" x 3", and mounted them on scarlet cardstock, which was mounted on black cardstock edged with the ekSuccess Binding Edge punch. I love how it gives it that torn notebook paper effect. 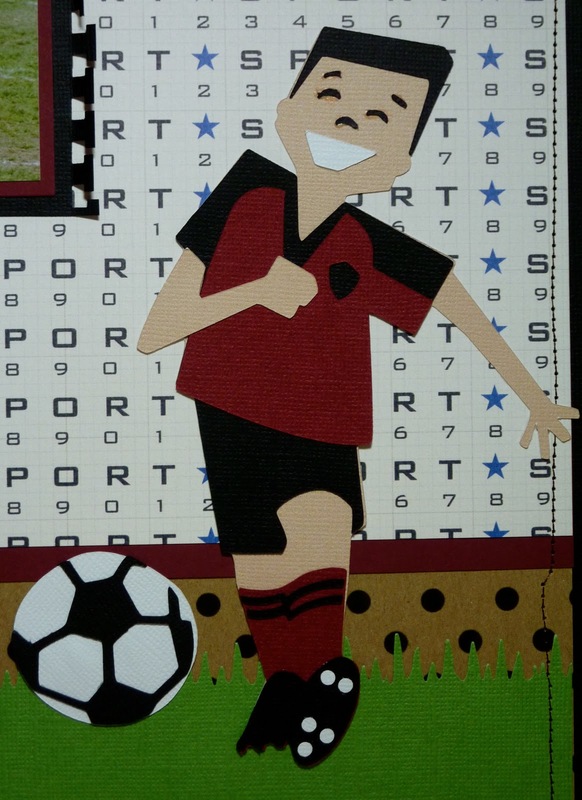 My funny soccer player was cut at 7 1/2" from the Cricut All Sports cartridge (the ball is part of the cut). I made the grass with my Martha Stewart Icicle punch on the green cardstock. I love how I get double duty out of that punch! 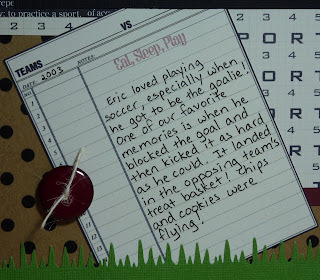 This journaling block was part of the Teresa Collins Sports Edition II collection. I stamped "Eat, Sleep, Play" from Soccer and added a button and twine. For my title, I used the Cricut Art Philosophy cartridge to cut my ticket and layer at 1 1/2". 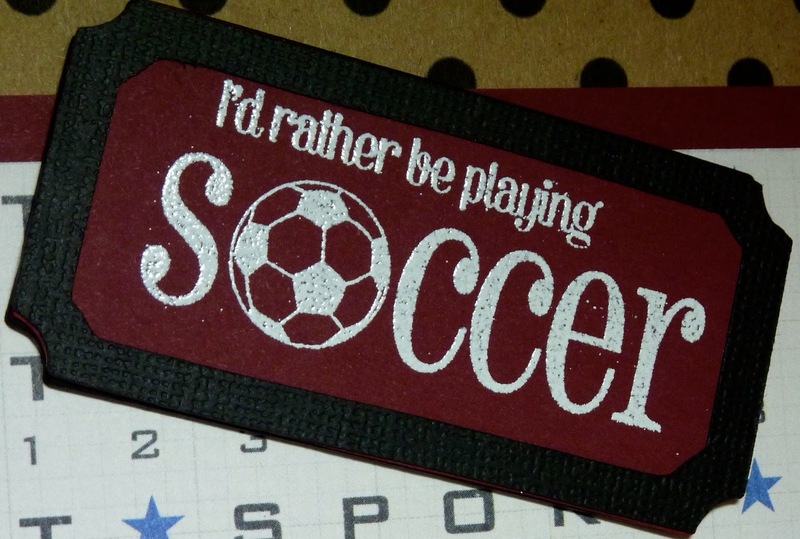 I heat embossed this awesome sentiment from Soccer and mounted the whole thing on a chipboard ticket that came in my Art Philosophy bundle. Here's a peek at the full Soccer stamp set. You can purchase it today at My Creative Time. For our giveaway today, we are giving ONE LUCKY winner a $100 gift certificate to Custom Crops! All you have to do is leave a comment here, as well as on the rest of the design team's blogs, AND also leave a way for me to contact you! Each designer will be picking a winner, and then Emma will use random.org to pick the winner of those 18 names. So remember, you have 18 chances to win! The deadline is Sunday night at midnight! Easy peasy! Good luck! ALSO, don't forget that all of the stamps and dies are available right now for purchase at Emma's store. There are three different bundles being offered for sale until Friday, January 27th @ midnight! All orders will start shipping out on Monday. 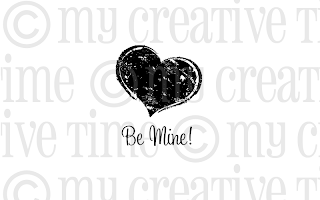 The "Be Mine" stamp shown above will be offered for ONE CENT for the first 100 shoppers! It was supposed to be FREE, but Emma realized she had to put in a dollar amount so that she could keep track of when she hit the 100th shopper. As soon as the 100th shopper hits, then she will offer this stamp for $3.99. Your next stop on the hop is the wonderfully talented Leanne! What a cool layout. I so love the Eat, Sleep, Play note. I also love how you framed the I'd rather be playing Soccer. Thanks for sharing. O M G!!!!!! I LOVE LOVE LOVE that little soccer player!!! WAY TOO CUTE!!! your entire layout is just PERFECTO!!!! Katie, I love your super cute layout! Love all the details! You did an awesome job as always! Thanks for sharing and hope you have a great day! Katie, your layout turned out fantastic! I love the ripped paper effect and the MS punched grass. 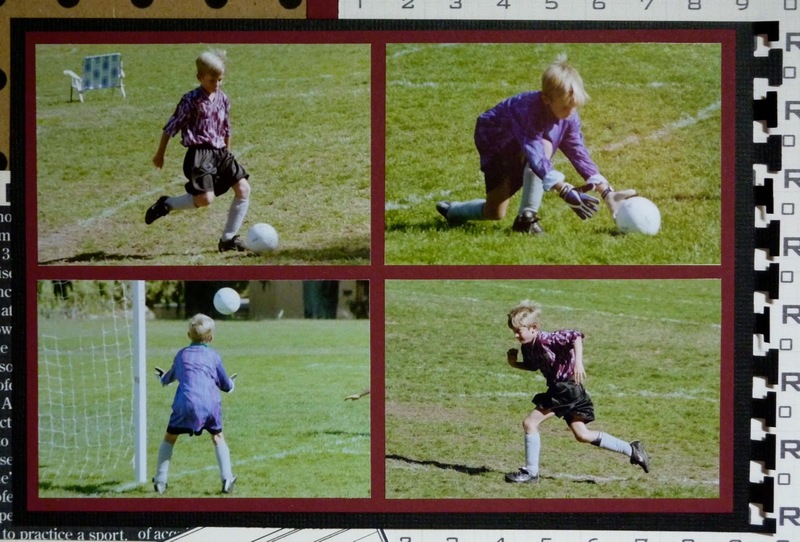 Your little soccer boy is simply adorable. What a Grreat Layout, I love it! TFS! 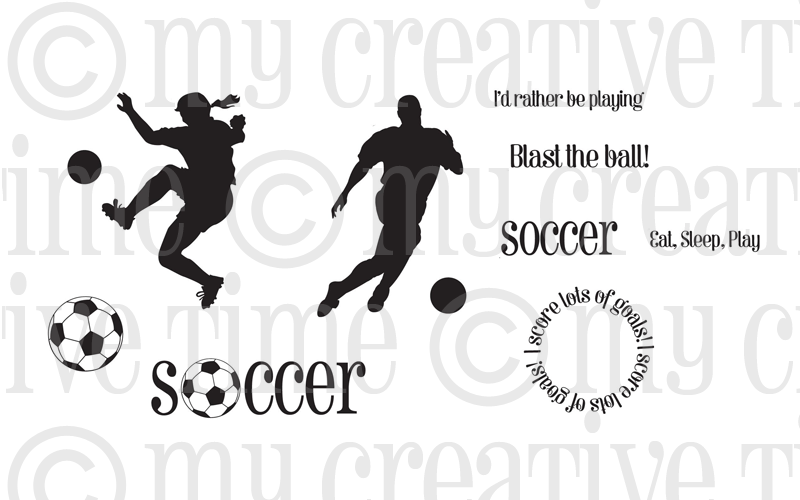 Hi Katie, love what you made with Emma's stamps and love your Soccer page!!! Great layout!!! So fun and sporty! Geat job! Very cool layout love the cricut cut!! Soooo lovin' this layout so much that I think I'll be "borrowing" it :). TFS!! Hi great job.Love the new stamps. Love the LO. sure do wish my kids played soccer! Love the LO, super cute! Great layout! My son played soccer for a few years when he was younger so I will have fun using this stamp. Your soccer player is soooo cute! Thanks for sharing! Wow, what a great layout. Love it! Thanks for sharing, enjoyed the hop. Cute LO! My son plays soccer, too! I think I'm going to have to get this stamp set. WOW!!! I totally LOVE your LO!!! Great LO love the little soccer dude you added. That little soccer guy is great! You did an awesome job on this LO. great layout! love how u embossed the ticket! thanks for sharing! My kids played soccer (many years ago). The grandson played in the last few years. Glad to see sports stamps are finally available. Love the little paper soccer player. WOW! great job! Love this release more and more! Great layout! Love the title and the soccer dude! Such a cool layout! All boy for sure, love that! I just love these soccer stamps they are awesome! what an awesome layout !!!! Very cute layout. Out of all things crafty layouts are still my favorite to make. Great job on yours! Your layouts is PERFECT!!! just perfect!!! Very cute layout!!! Love all the detail you put into it. This is a fantastic layout! I love all the little elements. What a super cute layout! I just LOVE that little soccer player! I have to admit, you made it look WAY better than the images look in the booklet. That's why I didn't use that cartridge...now I think I need to! Oh my goodness! I LOVE this layout, Katie. The soccer kid is fabulous-- and so are the pics of your own soccer kid. LOL This is awesome! Love it all, Katie! Great job! Super cool layout!! Love the soccer guy cricut cut. Love the layout. I love the colors you used on the layout. This is really cool! I have two boys who play soccer so this layout will come in handy! Love this! My daughter played soccer last year and I need this stamp set to scrap some of her pics. Awesome layout Katie! I see you used your sewing machine! love the papers and the design. great job! Awesome layout. Great use of the background stamps. Thanks for sharing. Wonderful layout!!! Thanks for sharing. Oh boy, your layout is soooo cute and cool. You did a great job. I love that stamp with the soccer ball in the word. Your lo is amazing! I love the colors with the kraft paper! Love that little soccer guy too! This stamp set is perfectly paired with your cricut cuts! LOVE this!!!! Your attention to detail is spot on!!!! Love the colors, and of course the stamps are fab!!! Thanks for a wonderful week of peeks! Have a great weekend! Great LO Katie. They grow up so fast. 2 things - thanks for doing a 12x12 layout and doing one on soccer. For some reason, that's been a hard one for me to create. Appreciate the inspiration! WOW! I love this layout! That soccer player is awesome! I have this cartridge and still haven't used it! I'm gonna have to get it out for my next soccer layout! Wonderful layout and great use of those stamps! Wow! That is one great layout. I like the boy cutout. Love your layout! It inspires me to get off the computer and go scrapbook! Your Layout is the best! I just love this. Thank you for the inspiration. Such a great LO love that stamp set tfs!! That's a really cute layout. (I know boys would rather hear cool, but it's cute)lol I enjoy your posts, very inspiring. Your layout is awesome. I love the paper and the soccer player is adorable. This LO is awesome, it is just well put together, you make it look so easy, TFS your blog is one of the most inspiring I have found, have a lovely wknd. Love your LO!!! 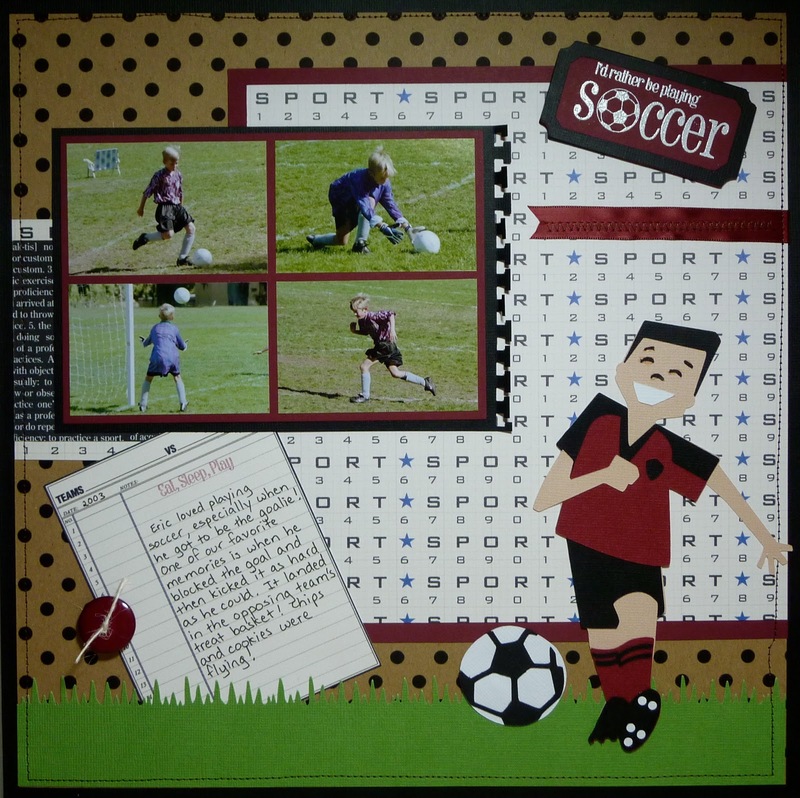 The details are perfect, the soccer player is so cute, the journaling block is great for adding those precious memories. Great job!! Katie - great layout of your son. I love the detail and the little story was cute. Thanks for adding the list of products you use on the bottom. Awesome layout! Love that cute cricut image!!! Wow, I love your layout.Great job. LLove the l/o, Nicely done. I especially love the cut of the soccar player. Love this page, it's everything that says kids playing soccer. Love your layout great job. Your layout makes me want to get back into the scrap room. Love what you did. What an adorable way to scrapbook his passion for Soccer! Great LO. I Love how you used the stamp set. Super Cute Layout! Love the sports stamp sets. Nice layout! I don't have anyone in sports...almost wish I did for these stamps. Cute layout, love the added details like the twine and button. What a great looking layout. Great stamps. Great job on your soccer layout! I think the icicle punch makes great grass...I might need to get that one! Cool layout! Thanks for sharing it! too cute makes me think of all the fun i had in soccer when i was a kid. This layout is just FABULOSU! There are so many details where does one begin! Okay first the stitching, LOVE it! The journaling, the papers, the cuts, the stamps, that punch( I have and have NEVER used..Lol) and the pictures! What a cutie and blonde! AMAZING job ~ as always!